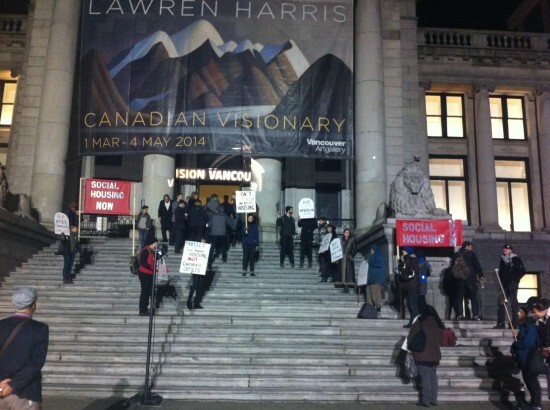 Social Housing Alliance holds a Vigil outside a Vision Vancouver fundraiser to mourn the loss of social and affordable housing in Vancouver, February 28th, 2014. The definition of social housing has been the focus of the low-income caucus currently participating in the Downtown Eastside Local Area Planning Process (LAP). While a definition of social housing seems simple, it will actually play a crucial role in debates over the DTES Local Area Plan (LAP) in the coming weeks. This week – on March 12th – Vancouver city staff will present a final draft of the LAP for the Downtown Eastside to city council. The Vision-led City Council will be using this opportunity to strike the definition of low cost housing and social housing in the City’s bylaws, and replace both with a new definition of social housing. This new definition of social housing is problematic for several reasons. The “or” between (c) and (d) implies that social housing could be any one of these and does not have to fulfill all of the four criteria. This means on the one hand that social housing can be for-profit, and on the other hand that rental housing can count as social housing irrespective of rent rates. Furthermore, section (a) states clearly that only 30% of units in a given building need to be set aside for core-need renters in order for an entire building to qualify as social housing. This means that regardless of the rents for the remaining 70% of units, all units will count as social housing. Core Housing Income Thresholds referred to in Section (a) are today commonly referred to as Housing Income Limits (HIL). HILs represent the income required to pay the average market rent for an appropriately sized unit in the private market. The HIL rents are in other words market rents. In Vancouver, the HIL for a bachelor apartment is an income of $35,000. This means that if an affordable rent is deemed to be ⅓ of a person’s income, the HIL marekt rent for a bachelor is $875 per month. It is clear that the housing income limit rents are far above what a person on welfare or disability, for example, can afford. Welfare provides a monthly cheque of $610 and in 2006, the median household income in the DTES was a meagre $13,691. While the LAP has outlined targets for affordability and social housing development, they will mean nothing if the definition of social housing changes. At the end of the day, bylaws override policy targets. If the by-law change is approved, it will mean that developers will no longer be required to make social housing affordable for low-income people. The Vision Vancouver council has been at the forefront of the neoliberal dismantling of social housing in our city. Now they want to dismantle the very concept. As Jean Swanson said in the February issue of the Downtown East, a definition can literally displace a community. Come to city hall on March 12th to speak out for a definition of social housing that doesn’t exclude low-income people. For more information about speaking at the public hearing, read Carnegie Community Action Project’s guide here. I DO NOT like any of the proposed changes!!!! the rewording! the ambiguous, the vague, the indifferent! CLEARLY !!! those who were elected (such a Katrina or Sandy sized disaster!!!!!!!) HAVE NEVER tried to exist even for a month on the welfare rate for a single person! @ $3.70 a day for a month for food. oops!!!! & the disrespecting to those who are not developers! “”Core Housing Income Thresholds referred to in Section (a) are today commonly referred to as Housing Income Limits (HIL).”” or Even some who persons work, 40 hours a week could not afford the above mentioned $875. per month. VISION HAS NO VISION except to line their personal pockets. I think you’re right, Jean – I think it means social housing can be A, B, C or D. What’s so unbelievable is that even if it didn’t mean that, even if the “or” was an “and,” the definition of social housing would still mean 1/3rd at most, the rest as any-price rental. This is why people turn to crime to make money. Nothing left to lose. The city is in control of issuing permits to build and open businesses. Who is doing the construction work? I wonder if the developer in this case would be the province (BC Housing) as i’ve heard that they own %80 of the buildings that are in question. The developer and the contractor have some input as well (quite a bit actually) and i’m wondering if anyone has created a re pore with the people appointed to oversee operations of the projects. Its so hard to beat city hall in their own game i’m wondering if a person was to take an approach that is a little less conventional a broader approach then butting heads with city hall. although i would love to see someone finally be able to defeat them i think its going to be challenging to arbitrate with them when they are the deciding arbitrators. That in its own would be close to a conflict of interest (being the party in arbitration and the arbitrators overseeing the discussion). sounds like a ticking time bomb. legislation is as it is because no one has changed it. not that it would help with the obvious time factor involved. The current VV Council seems to all about Elitism….spending 10 million on protecting single family housing along Point Grey Road in Kitsilano (where the Mayor recently moved) by re-zoning in to a Bike Path (which is very lightly used esp this time of year + there is already a Bike Route along 3rd Ave)….and now to Create Another Elitist Donut around a “Hole” of DTES abodes (of what quality is not clear) , very Clearly bows down to Developers who only want to Make Money @ the Vancouver Tax payer expense and @ the DTES residents expense…..while the Mayor can Enjoy – at 10 million $ expense….A Quiet Enclave for him and his friends. Disgusting!!! !